Since September 25, our market timing model has been in “neutral” mode (immediately after the S&P 500 sliced through its 50-day moving average). 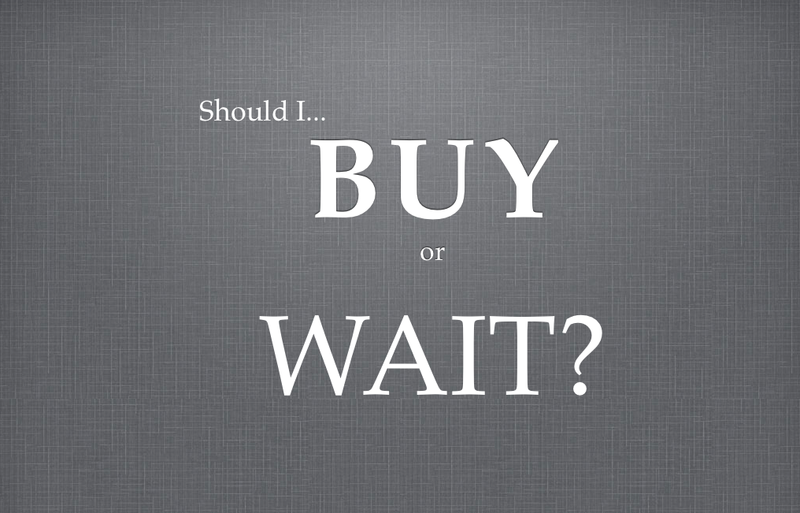 However, with stocks now attempting to find a bit of traction over the past few days, when is the best time to start buying again? In this blog post, I seek to answer that question by showing you a simple, yet quite reliable way to know when to step back on the gas pedal. Subscribing members of my nightly stock picking newsletter already know the Morpheus trading methodology is partially based on William O’Neil’s dependable� CAN SLIM trading system. With CAN SLIM and Morpheus, both proven to be profitable trading systems over the years, one of the most reliable indicators to re-enter the market after a price correction is the occurrence of a follow-through day. A follow-through day occurs when one of the main stock market indexes gains at least 1.3%, on higher volume, on or after the fourth day of a bullish reversal attempt off the lows. 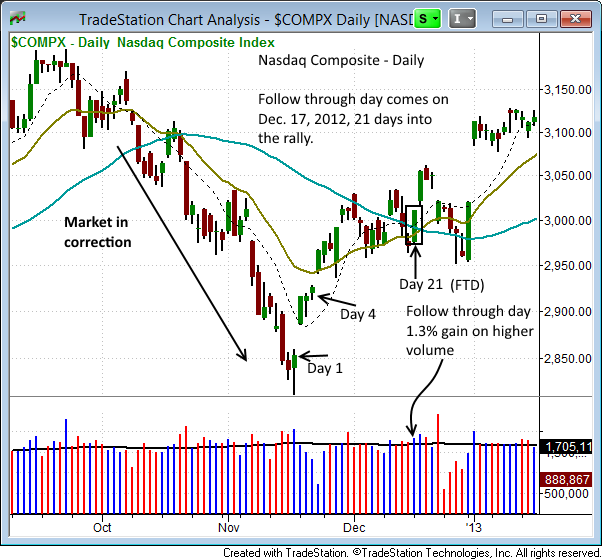 Below is a daily chart of Nasdaq Composite that shows the follow-through day that kicked off the dominant, long-term rally the broad market remains engaged in. Notice that the follow-through day did not happen until Day 21 after the reversal off the low. Again, in order to be valid, the follow-through day must occur on Day 4 or later� (not necessarily right on the fourth day). A follow-through day signals the likelihood of a sustainable rally, and would put our timing model back into “buy” mode. 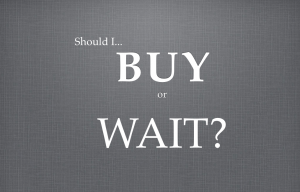 Nevertheless, I want to be sure you understand it is NOT� a requirement to wait for a follow-through day before buying quality stocks that are emerging from solid basing patterns; just don’t go crazy with your overall risk exposure (stay off margin). Further, since our “buy” signal is mechanical, it needs to be confirmed by strong price and volume action in leading stocks anyway. As always, the big question to ask yourself is whether or not bullish chart patterns can still be found right now. If so, are those stocks at or near low-risk entry points? Although aspects of our trading system, such as the timing model, are mechanical and rule-based in nature, discretion still plays a major role in our overall trading strategy. Particularly if you are new to active trading, it is extremely important for you to understand how to properly determine the the size of every stock you buy. As a general rule, newer traders should limit the maximum dollar loss of any single swing trade to 0.5%-1% of account equity. For example, maximum risk of loss for a new trader with a $50,000 account should be limited to $250 (0.5%) to $500 (1%). Newer traders should stick with this position sizing parameter until they are comfortable executing the system. But once a certain comfort level is reached through experience, risk can then be bumped up to 1%-2% of account equity per trade. However, the above risk guidelines for both new and experienced traders are only for perfect trade setups in an unquestionably bullish market. When the stock market is in correction mode (or even in transition), an excellent way to reduce your overall risk is to simply reduce your average position size until the market generates a fresh new buy signal. With our market timing system presently in “neutral” mode, for example, average share size for any new trade entered in our newsletter is presently reduced to 25%-50% of full position size. By understanding exactly how much money you should be risking on each trade in ideal market conditions, you can easily trim your risk in a shaky market by reducing your share size to just 1/4 to 1/2 of your normal position size. Decreasing your capital risk exposure during market corrections, while conversely maxing out your maximum dollar risk in overly bullish markets, is the key to consistent risk management that will keep you in the trading business for the long-term. If you’re a subscriber to The Wagner Daily, be sure to attend our next Live Q&A Webinar (October 8 at 12 noon ET), where we will more thoroughly dive into money management and position sizing. What do you think of the “follow-through day” concept? What indicators do you use to help you time the market? Share your thoughts below. With the stock market taking another dive today (10/7), what would tell us that we need to ‘reset’ the count back to Day 1 ? Generally, we reset the count if the prior swing lows are (convincingly) violated. In this case, the count would reset if Nasdaq closed below the October 2 low. Also, another wave of distribution (higher volume selling) can make that happen faster. Every time I get to read your blog, I always learn some thing new and better. Much appreciate your work. Just a question on above: Do the reversal rally of 4 days from bottom need to have all 4 days close in green? Or other way is it needed all the 4 days to close above the previous days high always ?? Sorry if this is a naive one. Many thanks for reply. No need to apologize for your question…it is completely valid. No, all four days do not need to close in the green. In fact, that usually does not occur. The main point is that the count starts on the first big bullish reversal day that follows a correction, and the count remains just as long as the index holds above the low of the reversal day. Also, remember the follow-through day can occur at any time after Day 4, as long as those lows are violated. How is Morpheus strategy different from CAN SLIM? We use CANSLIM’s fundamentals to locate top ranked stocks. However, our entry points are much different than CANSLIM. They teach traders to buy at obvious breakout points at or near the highs of a valid basing pattern. We prefer lower risk entry points, so we look to build a position much earlier in the base using a combination of downtrend line breakouts, higher swing lows, and the 50ma. 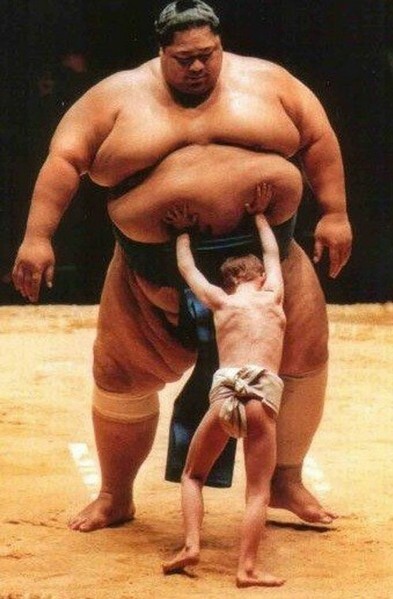 We have two strategies we run in the stock portfolio. The main approach is very much like CANSLIM, where we look to hold stocks with top ranked fundamentals that are breaking out to new 52-week highs for several weeks or more. The second approach is a momentum one, where we only look at price and volume action (fundamentals do not matter). These are basically swing trades with a holding period of 3 to 15 days on average.